Wednesday, April 24th from 11:30 a.m. to 1 p.m.
Andrew Sikora is associate professor of Otolaryngology and Vice Chair for Research, Carolyn Wiess Law Research Scholar, and Co-Director of the Head and Neck Cancer Program at the Baylor College of Medicine in Houston, Texas, USA. He earned his MD and PhD in Microbiology and Immunology at the Albert Einstein College of Medicine in New York City. 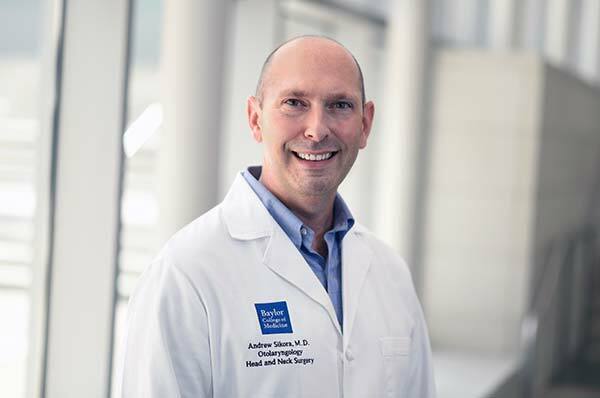 Dr. Sikora then completed a residency in Otolaryngology at New York University Medical Center, followed by a clinical fellowship in Head and Neck Surgical Oncology and a postdoctoral fellowship in Cancer Immunotherapy at the UT MD Anderson Cancer Center in Houston, Texas. Dr. Sikora’s research focuses on understanding and reversing mechanisms of tumor-mediated immunosuppression; the immunobiology of HPV-related head and neck cancer; and the development of novel in vivo models for the study of tumor biology and therapeutic response. He is the principle investigator of observational and therapeutic clinical trials designed to understand the impact of standard-of-care therapies on anti-tumor immunity, and to test novel immune-based therapies in head and neck cancer. As a nationally-recognized expert in cancer immunotherapy and clinical research, Dr. Sikora is a member of the US National Cancer Institute (NCI) Head and Neck Cancer Steering Committee, the NRG Oncology cooperative group Head and Neck Cancer Core Committee, and frequently serves on US National Institutes of Health (NIH) grant review panels. His laboratory research is funded by the NCI, the National Institute of Dental and Craniofacial Research (NIDCR), and the Food and Drug Association (FDA). Dr. Sikora is also an avid mentor and educator whose trainees have received competitive training awards from the Doris Duke Foundation, Howard Hughes Medical Institute, NIH, the Cancer Prevention and Research Institute of Texas (CPRIT), and the German Cancer Aid Foundation, among others. Purchase tickets online or contact us at rsvp@thewomensfund.org or 713-623-6543 to purchase.